On Friday, P&T held their wedding at the Narrow Water Castle, County Down, Northern Ireland. It was magic. 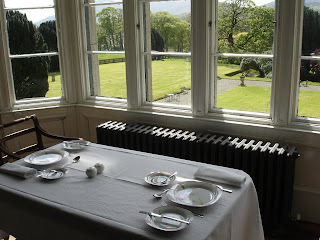 This is the view from the bridal suite over the grounds, looking south, with the hills of County Louth of Ireland off in the distance. There are actually two castles, the semi-restored keep, and a privately owned castle and estate set across the road hill.